And a good ability of the material to yield to high-class processing, to achieve amazing quality of the final product. 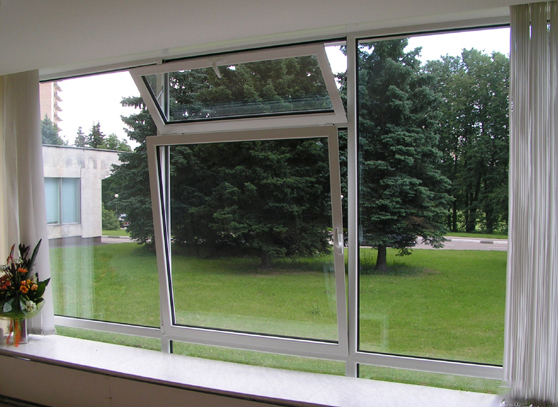 Aluminum windows have a variety of types. These are so-called warm and cold windows. Cold windows are used for non-residential buildings, such as barns, parkings, galleries. Warm windows are manufactured with the use of insulating materials, special technologies allowing keeping warm and are well-equipped with single or double-pane units. Colour can be selected according to the desired design. Another advantage of the aluminum windows is that they cannot accumulate dust and dirt on themselves, that’s why the caring of these windows is minimal. An important difference and the main advantage of windows and structures from aluminum is complete fire resistance. Aluminum windows can be both deaf, which don’t provide the opening at all, and opening. Windows opening can be of any type: full tilt, pan-tilt, or only for ventilation. Aluminum windows retain their properties for a long time, their lifetime is about eighty years. The peculiar properties of aluminum make it easy to transport and assemble structures made ​​from it . Aluminum doors, due to the physical properties of the material, are light and at the same time very strong, structures that can serve for a long time. Aluminum doors easily and without consequence tolerate extreme temperatures and resist corrosion – for this reason they are used in different climatic zones. Hinged aluminum doors – can be single-or double-leaf. Pendulum aluminum doors are installed at the places where the stream of people is medium and are opened / closed in both directions, they are made of cold-profile, may have vestibule. 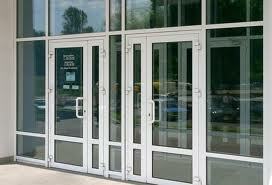 Radius aluminum doors with automatic opening, are installed in places where there is a large flow of people. Opening / closing can be performed both with a manual device, and with the help of various automatic sensors and detectors.